Myth: The way to burn off fat is with long, daily workouts. Truth Serum: Putting overweight or obese people through torturous workouts, like those seen on “The Biggest Loser” TV series, will certainly burn calories. But regardless of workout intensity and/or duration, the only way to lose weight and body-fat is to consume fewer calories than your body needs to maintain its present state. A combination of cardio and resistance exercise is certainly important. But a proper diet is number one. See Ab Exercise and a Trim Waistline. Myth: For both fitness and body-fat reduction, the rule is: No pain, no gain. Truth Serum: Mild muscle soreness is common when starting an exercise program. But actual pain, especially in a joint, means you are doing something wrong, such as using improper exercise form or doing too much; or, maybe, there is an underlying problem that should be checked by a doctor. If you are a senior, improvement comes from pushing yourself gradually — not beating yourself up. Myth: No matter what you do, as you get older you lose muscle and gain fat. Truth Serum: This one is true — if you do nothing to prevent it. 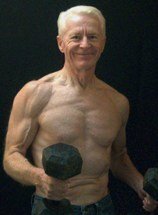 But even in old age, you can increase lean body mass (muscle) and decrease fat through resistance exercise and a good diet. Myth: Strength training makes women “bulky." Truth Serum: Not unless you’re talking about female pro-bodybuilders doing lots of heavy lifting and often taking steroids. The truth is weight training is the most affective way to tone and strengthen muscles, but most women lack the testosterone levels to build huge, bulky muscles. Myth: For maximum fat burning, early morning workouts are best. Truth Serum: There may be some advantage in losing more fat by working out before your first meal of the day, as your body must tap into more of its reserves. But this is fine-tuning (and controversial). If it is convenient and you have the energy at that hour, try it. Overall, though, the best time to work out is a time when you can most consistently fit exercise into your day. Consistently is the key word. Myth: If you stop exercising your muscle turns to fat. Truth Serum: Muscle and fat are two different things, so that’s impossible. However, muscle does shrink when it is not used. If you stop exercising you are likely to gain fat because you are not burning as many calories. But muscle cannot transform itself into fat. Myth: The more out of shape you are, the longer it will take to see results from an exercise program. Truth Serum: Actually, the less fit you are the greater the relative improvement will be, especially in the first few weeks or months of an exercise program when, percentage-wise, the greatest gains are made. Myth: Heavy people have a harder time burning calories when they exercise. Truth Serum: The more you weigh the more calories per minute you’re guaranteed to burn when you’re doing weight-bearing exercises. It’s a simple law of physics. You’re doing more work because you’re moving a greater mass. Myth: If you cut fat out of your diet you will lose weight. Truth Serum: Reducing the total number of calories consumed daily is the key to weight loss. And cutting back on animal fats is a healthy thing to do. But certain other fats are essential to good health. Read food labels. Many low-fat or nonfat products are loaded with calories from various forms of sugar. And no one needs processed sugar. See Healthy eating. Myth: If you’re thin you are healthy. Truth Serum: Not necessarily. Sedentary thin people have a higher mortality rate than physically active but overweight people. Of course, fit people with healthy body-fat percentages are by far the healthiest of all.